Dozens of bikes in Daley Plaza await riders in the rain during the launch event. Chicago’s new bike sharing program, Divvy, launched on Friday and over a busy weekend marked by both the Blackhawks victory parade and the city’s annual Pride Parade. On Sunday, 69 Divvy stations located as far north as Diversey Parkway and as far south as McCormick Place showed as active on the program’s mobile app, Cycle Finder. Although Divvy was originally scheduled to launch on June 14, the date was pushed back to June 28 because of a missing part, said Chicago Department of Transportation Commissioner Gabe Klein. Although the delay was unplanned, he called it a “blessing in disguise” because of the technical problems that occurred during New York’s recent bike share launch, which uses the same software that Divvy relies on. On Sunday, Ian Streicher, of Lakeview, returned a Divvy bike to the Sheffield Avenue and Fullerton Avenue dock after going for his first ride. He decided to buy a one-day pass and try out the program because his own bike had a flat tire. “My experience is that there were a couple of little glitches, not with the bike but just checking the bike out,” he said. Streicher said that the credit card machine tried to charge him $14 rather than the $7 it should have for a one-day pass. He also had difficulties returning the bike to the dock, but a Divvy staff member was available at the site and helped him return the bike to a different spot. There were also glitches occurring with Divvy’s Cycle Finder app. The app is supposed to indicate the number of bikes available at each station so riders can easily locate and return a bike, but was showing inaccurate numbers of bikes available at some stations. The app also wasn’t operating for some stations, like the one at Wilton Avenue and Diversey Parkway, which showed as “Not Installed” on the app even though bikes were available at the location. Chris DeBoo, a rebalancer at Divvy, is in charge of making sure there are enough bikes and open spots at each station. On Sunday, he said that it took him more than two hours to drive the Divvy van through his route because of the traffic from the Pride Parade. So far, DeBoo said that he thinks the launch has gone pretty smoothly. Divvy’s current goal, he said, is to keep each station about 50 percent full of bikes. But this may change, he said Because the program is still so new, these first few weeks and months will be focused on learning how the bikes are used, which stations are busiest and collecting other data so Divvy can determine how many bikes are needed in each location and how often they need to be rebalanced. 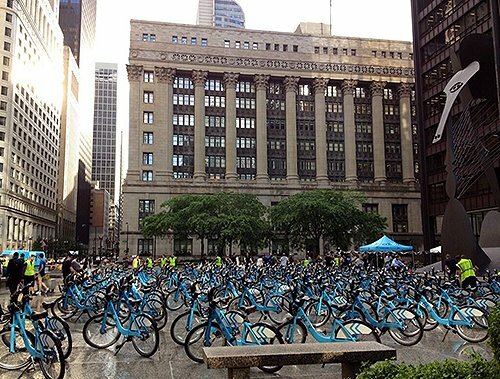 Last Thursday night, Divvy celebrated its program launch by inviting 200 of its “Gear” founding members to go on their inaugural rides from Daley Plaza. A much smaller number of attendees huddled beneath umbrellas and tents, trying to get out of the rain. They listened to Klein thank those involved in getting the program off the ground as well as the members in attendance. Klein said that over the next 12 months, the program will expand to 4,000 bikes and 400 stations located across the city, with the goal to have 300 in place by the end of the summer. 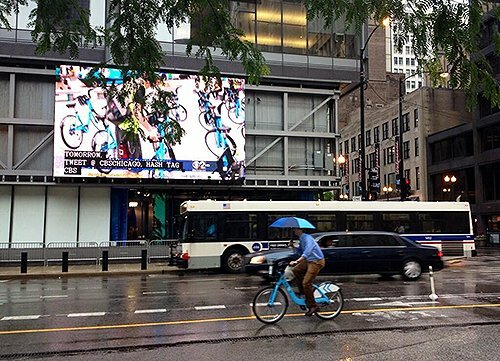 This will make Divvy the largest bike share program by station in the United States. After Klein’s speech, attendees were invited to take one of the 200 bikes in the plaza, tagged and organized in alphabetical order by last name. Dozens of Divvy employees were available to answer questions, help members find their bikes and cart off unclaimed bikes at the end of the evening so they could be dispersed to stations throughout the city. One of the founding members at the event, Jonathan Crossland, a self-employed chef who lives in Ukrainian Village, plans to use Divvy as an alternative way to get around the city. He owns his own bike, but likes the flexibility that the program provides. He also thinks that Divvy is a sign that the city is trying to become friendlier to bikers. Divvy bikes lined up on South Michigan Avenue during the Blackhawks parade.